Steve Jobs said, “Everything is important. Success is in the details.” We believe this to be true. When it comes to the medical field, don’t let your patients make negative assumptions about your practice because of a missing curtain hook. A patient’s privacy and dignity can be in question anything less than the best privacy curtains, tracks, and hardware are used. 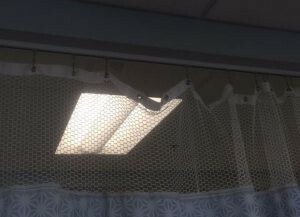 Curtain-Tracks can help you create a private and professional space for your patients, whether it is updating and fixing current curtains and hardware, or designing a new facility from scratch. From ceiling to floor, our products create a high quality, functional, and visually appealing room in any medical facility. Check out the photo above. What do you notice first? We bet it’s the missing hooks. It’s such a simple thing, just one small hook that costs just a few dollars. But, the messy look can easily lead patients and their families to assumptions that are not good about the care they are about to receive or the upkeep of the facility. Consider keeping a few extra small replacement parts around to keep exam rooms looking their best at all times. Not only can Curtain-Tracks help revive existing systems, we can create a sleek and functional look with everything you need to start at the beginning. Our ceiling mounted curtain tracks are specifically created for use in medical facilities like hospitals, clinics, offices, and the like. They are visually sleek, so they blend nicely with the clean lines of any hospital or office. They are strong and heavy duty, meaning these tracks can stand up to frequent opening and closing, and even to the most forceful patients, nurses, or doctors. Our most popular curtain for medical facilities is our Sundance line. These curtains have an antimicrobial finish which inhibits the growth of bacteria; they are also machine washable and include stain and odor eliminating properties, perfect for hospitals, clinics, and physician’s offices. We keep a selection of our curtains on hand at all times in order to help customers who have an urgent need. When time is of the essence, our customer service team is here to help you find the best and fastest solution. Check out our selection of quick ship curtains to see what measurements, fabrics, and patterns are available today. We can also get you replacement parts for your curtain tracks in a jiffy. Check out our parts and accessories page to see our huge selection. You can even find a part for a system that was not originally purchased through Curtain-Tracks! Whatever you do, just be sure to contact us today at www.curtain-tracks.com or 1-888-434-7444.